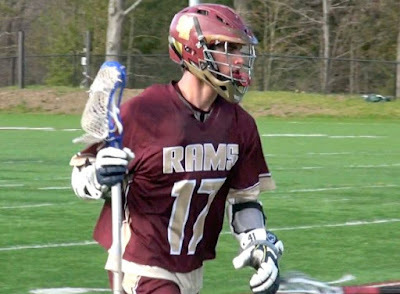 Devin Pietz and his Shepherd Hill Rams still have work to do, but a big win at Oakmont has them in the thick of the tournament race. The race for the postseason is heating up around Central Mass, and several lacrosse teams have already clinched a spot in the state tournament. As we enter the middle of May, here is where all the teams stand in the three different districts CMass squads call home. To qualify for the postseason, a team needs to achieve at least a .500 record, or win their league. Since there are no leagues in Central Mass where a champion could conceivably finish the year with a losing record, just count on the fact that your favorite team will need to get to .500 to make the tournament. The only exception to that being Groton-Dunstable, who has already qualified via the Sullivan Rule, which we'll get into below. And even with that exception, the Crusaders are likely to again have a winning record. Anyways, check out our complete postseason breakdown below. Ed. Note- For our purposes, a team "on the bubble" must win more games than it loses the rest of the way to qualify for the tournament. The only teams mathematically eliminated so far are Fitchburg and Nashoba, the latter being a young team that didn't get to full strength until recently. Don't be surprised to see the Chieftains play the part of spoiler down the stretch, but many of their league rivals are already in the postseason. Algonquin and Westboro, our Top-2 ranked teams in the region, lead Mid-Wach A into the playoffs, while Wachusett is just a single win away from qualification. Worcester, meanwhile, is still in decent shape, despite a tough loss to St. Bernard's Tuesday. WooLax needs only two wins in its final five, and with a pair of winnable games against Northbridge on the horizon, along with winless St. Peter-Marian and struggling Milford still on tap, Worcester seems set for another playoff berth. Marlboro's hot start and St. John's midseason offensive explosion also have both those teams in the tournament. On the other hand, Leominster once seemed like an inevitable tournament team, but the Blue Devils have lost six of their last seven, including their most recent three games. Leominster must now go 4-2 down the stretch, with tough games against Oakmont, St. Bernard's, Shepherd Hill, Tyngsboro and Westboro looming. Meanwhile, North Middlesex scored a pair of upsets over Oakmont and Leominster this week to keep its postseason hopes alive. The schedule doesn't favor the Patriots, who must go 5-3 against a brutal slate, but don't count NM out yet. Shepherd Hill took a big step toward the tournament with a win at Oakmont yesterday, but the Rams still have work to do, needing three wins in their final five to get in. None of those will be gimmes, as games against fellow bubble teams Leominster, North Middlesex and Tantasqua loom, along with a difficult game against Littleton Thursday. Tantasqua still has a lot of lacrosse to play, but the Warriors seem to be in decent shape. A tough early schedule that included a pair of games against Grafton, and a trip to Western Mass power Minnechaug has Tantasqua in a bit of a hole, but there isn't a team left on the schedule the Warriors can't beat. They'll need to go 6-4 the rest of the way, which is certainly something they're capable of. Finally, we get to Shrewsbury, a playoff regular who fell victim to a brutal early schedule that included Algonquin, St. John's, Westboro, Wachusett twice, Groton-Dunstable, Minnechaug and Marshfield. The Colonials aren't going down without a fight, however, knocking off Wachusett the second time around last Thursday, and now ride a three-game winning streak heading into tomorrow's showdown with Westboro. Shrewsbury will need to go 4-2 against a still tough schedule that includes rematches with Westboro, Algonquin and Groton-Dunstable, along with tests at Marlboro, Sharon and North Middlesex. There isn't an easy game left, so if the Colonials get in, they'll have done it the hard way. Reigning district champion Grafton is already in, and will likely compete for the top seed in the bracket with Western Mass mainstay Mt. Greylock. Either way, the Indians seem destined for a Top-2 seed and will enter the tournament as favorites to again claim a district crown. After Grafton, BVT is in line to win the Colonial and be a tough out, while St. Bernard's again has the feel of a team that can score with anybody. The Bernardians got in with a tough win against Worcester yesterday, and are now battling for seeding with a number of solid Western Mass squads. In just its fourth year as a varsity program, Monty Tech is looking for its first ever playoff berth, and only needs to go 2-5 the rest of the way against a manageable schedule. Led by Eric Glover, the Bulldogs seem ready to realize their tournament dreams. Also nearly in is Nipmuc, a team that still has a tough slate ahead, but enough talent to get the two wins it will need to qualify. AMSA has defied the odds to stay alive so far, and the schedule actually sets up nicely for the Eagles, who must go 4-3 the rest of the way. With winnable games against Fitchburg (twice), St. Peter-Marian and Nashoba Valley Tech, don't be surprised if AMSA makes its first-ever postseason appearance. Northbridge will have a tougher time of it, needing to win four of its final five, with a pair of those games against Worcester, and others against fellow "bubble teams" Hopedale and Leominster. The Rams aren't out yet, but pretty much every game is a must-win from here on out. *G-D qualified via the Sullivan Rule, which says that teams playing in leagues comprised of teams primarily a division above them (in this case, the Crusaders are a Division 3 team playing in Mid-Wach A, where every other team competes in Division 2) only need a winning record against teams in their own division. Since the Crusaders have already won their only two games against Division 3 competition, they're in, though they are likely to achieve an overall winning record as well. Joining the Crusaders in the playoffs are the Top-2 teams in Mid-Wach B. After splitting the season series against each other, Littleton and Tyngsboro are likely to share a league crown, and continue jockeying for tournament positioning with each other the rest of the way. Meanwhile, Oakmont need only go .500 the rest of the way to lock up a second consecutive tournament berth, and Hopedale is on schedule to make the first playoff appearance of its three-year history. The Blue Raiders may be a game below .500 now, but with rematches against Bellingham and Northbridge teams they've already defeated this year, Hopedale is set up nicely to win three out of its final five to make the tournament. The other teams on the bubble aren't in such great shape, as all three Mid-Wach C teams will need to post winning records against tougher slates. Thursday's Hudson at Lunenburg game could be a de facto elimination matchup, and Hudson then travels to Bromfield next Thursday for another do-or-die contest. In between, the Hawks will have to deal with Littleton, St. Bernard's and Marlboro, before closing the season against Wachusett. And they can only afford one loss the rest of the way. Like Hudson, Lunenburg can only afford one more defeat. The Blue Knights must go 4-1 down the stretch, and with games at North Middlesex, Monty Tech and Marlboro, that may be a lot to ask, not to mention their aforementioned home game against Hudson. Bromfield probably has the best chance of any of these teams to make it, needing to go 5-2, but will face challenges against AMSA, Monty Tech, Hudson, St. Bernard's and Oakmont. They have a bit more room for error, but it still isn't going to be easy. Absolutely fire stuff. Your efforts are appreciated!